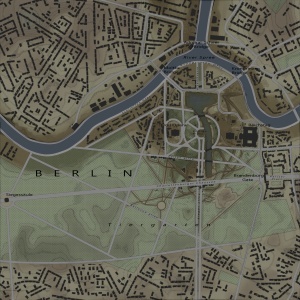 Berlin is a ground forces map available in all modes. It is an accurate representation of the area surrounding the Reichstag building (the meeting place of the German parliament), as it was at the end of the Second World War. The map was the first tank map to take place exclusively in a city and was added in Update 1.49 "Weapons of Victory". It was also one of the first maps where a large number of buildings were destructible, allowing players to shoot through them, or collapse them with artillery fire / HE shells. Teams usually spawn in the north and south of the map, and fight for capture points at various locations in the middle of the map. The East of the map is taken up by the Reichstag building; teams fight for a capture point that is often located amongst a group of ruined building, just in front of the Reichstag. 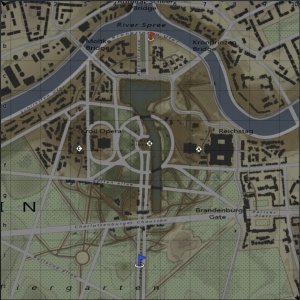 Players can flank the enemy by moving down the road that runs behind the Reichstag, or advance through a part of the ruined city behind the Reichstag, if they want more cover. Teams will often exchange shots from the areas north and south of the Reichstag, using the piles of rubble, and destroyed buildings as cover. 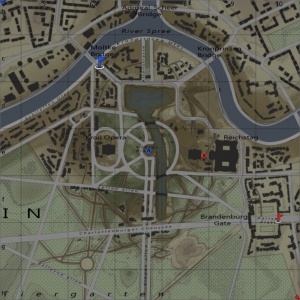 The middle of the map is a large open area (the Platz der Republik or Republic Square in real life). The area is littered with destroyed tanks and craters which serve as just about the only cover for those looking to advance through the area. A large water filled antitank ditch has been carved into the land, providing a way for players to advance, with more cover than would otherwise be available. Part of this ditch is sometimes used as a capture zone. Players can shoot into the centre area from the north, south and east of the map, making advancing through the area risky. The Western area of the map is part of the destroyed city. Players flight at reasonably short range, round the destroyed buildings. Players can move between the ruins to work their way around the sides of their opponents, or flank them through the more open area to the west of the ruins (although this leaves them open to fire from enemies anticipating such a move). The tank battle map is restricted to 1.2km x 12.km and the air battle map is 65km x 65km. The Battle of Berlin was the final major offensive operation in the European theater of World War II. Soviet forces started their final push into Berlin on the 16 April 1945; two soviet army groups attacked Berlin from the east and south, while a third overran German forces positioned north of Berlin; the Red Army proceeded to encircle Berlin, before the main battle for the city commenced. The shelling of Berlin started on the 20th of April, and continued until the end of the battle. Soviet forces are believed to have dropped a greater tonnage of ordinance on the city during their 13 day artillery bombardment, than that dropped by allied bombers on the city. On 23 April, the first Soviet ground forces penetrated the outer suburbs of Berlin and by 27 April, Berlin was completely cut off from the outside world. The battle for the Reichstag (where this map is based) started on the 29th of April, and lasted for three days. On the afternoon of the 30th April the German leader Adolf Hitler killed himself and the next day (1st May 1945) German forces in the city began surrendering, and by the 2nd of May nearly all German forces in the city had surrendered. A few groups of Waffen SS continued fighting from within buildings, the soviet forces simply blew up any such buildings. On the 2nd of May the famous picture of two soviet soldiers raising the soviet flag on the roof of the Reichstag was taken, symbolizing the German defeat and the end of the Battle. Germany surrendered on the 8th May 1945 ending the war in Europe. There are three Capture Points. 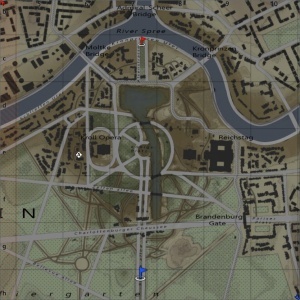 Point A will be in the east side of the map right in front of the Reichstag, B will be in the center anti-tank ditch slightly on the west bank, C will be in the ruins to the west. There are three configurations of the conquest mode, each with one Capture Point. In Conquest #1 the capture point is in front of the Reichstag. In Conquest #2 the capture point is on the bank of the antitank ditch. In Conquest #3 the capture point is in the ruins, in the west of the map. There are two capture points, each owned by one of the teams. Point A is in the centre of the map and Point B is in front of the Reichstag. [Devblog] New Tank Location "Reichstag"